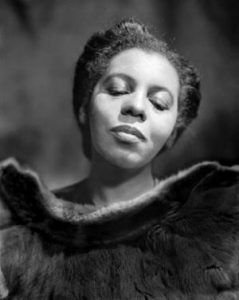 Photo: Portia White, a black Canadian opera singer who lived from 1911-1968. Photo by Yousuf Karsh accessed on Wikimedia Commons. Black Canadians are people of Black African or Black Carribean descent who reside in the country of Canada. The term “Black Canadian” is accepted more than the term “African American” in the Canadian context due to the Caribbean and African hertiage of the population group. The majority of Black Canadians are of Caribbean origin, though the population also consists of African American immigrants and their descendants (including Black Nova Scotians), and also many African immigrants. Blacks make up the third largest visible minority group in Canada. At the beginning of the 20th century, many blacks left Oklahoma’s environment of segregation in pursuit of the Canadian land incentives advertised to immigrants. Eventually, though, the size of this movement itself sparked a racist backlash, which sought to stem the tide of black farmers seeking the opportunities of Canada’s advertised rich soils and favorable climate. The Black – Canadian population data represent DNA samples from 179 Black Canadians. Samples were provided by the Royal Canadian Mounted Police. Source publication: RCMP/CFS (Canadian) STR frequency Web site Canadian Society of Forensic Science.